If I want to make a gown for 1874, I can be very sure of what was fashionable, what was common, and what was exceptional but within the real of possibility, based on all of the above. Although being used to those kind of sources is helping me here - I'm used to the biased nature of anti-fashion polemics, for instance, so I know when to take descriptions with a grain of salt; I have a handle on what types of stitching and construction were used for a few hundred years, so I have a good sense of what methods are probably too modern for the pre-Renaissance. You don't get that in the Middle Ages! Scenes in illuminated manuscripts are often small and don't have that much detail. Very, very few garments survive, and they're usually kept in European museums. Textual descriptions are few and far between, and vague. Monumental brasses and effigies were not always made with up-to-date clothing. The research into construction is frequently on individual websites (sometimes really old ones with grainy, small photos) and it can be difficult to tell when someone's interpretations and conclusions are about approximating a "medieval look" and when they're working at likely period solutions. Textiles and Clothing, c.1150-c.1450. This book goes into incredible detail about fibers, weave structures, types of stitches used, dyes, and more! I never planned to get into making braids and ribbons and such, but I'm tempted. On the whole, having the information about what's been found on extant scraps in archaeological digs makes me feel more secure in making choices aboutwhich stitches and techniques to use in the future. Edyth Miller's blog, The Compleatly Dressed Anachronist. Edyth is an inspiration, and one of the people who planted the seed of my growing interest in the mid-15th century and points earlier. She's dedicated to primary sources and finding authentic methods and solutions, and it's a treat to read her posts. Katafalk is another inspirational blog, for the same reasons! I've also been hard at work pinning primary source images - adding a lot to my 1400-1449 and 1450-1499 boards. And there are still sources out there I've yet to find! (Welcome to the new and redesigned A Most Beguiling Accomplishment! All old links will redirect to the new URL, don't worry about updating bookmarks or pins. Experimental archeology is very interesting, and I look forward to reading about your late Medieval fashion analyses and experiments of sewing and cutting. Thanks for linking to your sources of inspiration - now I've added another blog or two to my reading list. I meant to write this earlier, but I was so distracted by the fascinating NESAT XIII presentation on Lengberg dress linings that I spotted on your blog roll, and quite forgot! That presentation was amazing! It honestly kind of blew my mind. While I'd come across the deep-set armscyes through La Cotte Simple, I didn't know about the other sophisticated techniques they found in the remnants of that gown. The Lengberg bra was waaaaay oversold in comparison. I look forward to your research! I've just been musing on looking into earlier periods, so keen to pour through your pins for ideas! Hello! It is nice to find others who have similar interests. 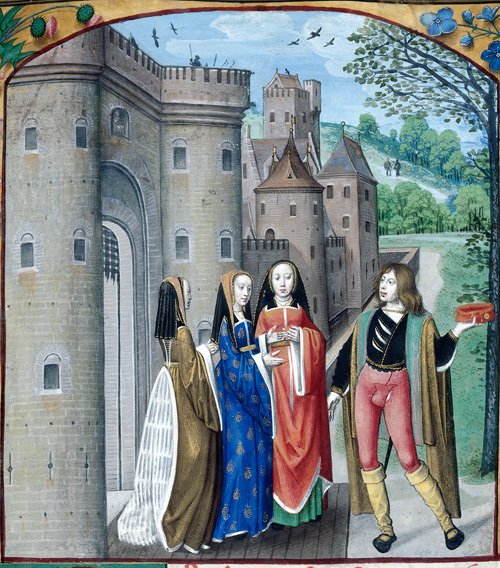 I plan on recreating a dress similar to Anne of Brittany style.